Radd Repro: Retro ROMhacked Reproductions: REVEAL: Phantasy Star FM Retranslated! Here's what I've been working on lately, The original Phantasy Star for Sega Master System! As always, there's something special here. This is the Japanese version, completely retranslated. So why retranslate a game that already has an English language release? Well two reasons. First, there's a smaller font size in use which gives more screen space for an expanded narrative. Far more detailed and interesting story in just the first few minutes of play I gave it. The second reason is for the FM soundtrack. There's absolutely amazing music hidden away in many Master System titles, easily rivaling Genesis. Problem is we never got the FM audio hardware expansion in the USA. 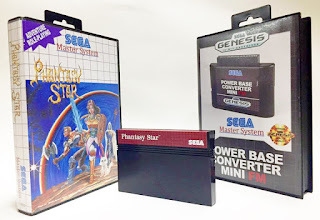 Most software titles kept the FM audio intact in the USA despite lack of playback in USA hardware, unfortunately it was inexplicably stripped out of the USA release of Phantasy Star. So even if you get your hands on a Japanese FM expansion add on for your system, you still get Phantasy Star with standard audio. Well now FM AUDIO IS BACK! Comparison video here: http://youtu.be/zDPvSoiCAWg I'm currently giving it a full playthrough to make sure it's error free. The plan is to have a couple copies for sale, one with a special version of the Power Base Converter with FM audio support and another standalone copy (for those who already have FM audio capability). It's a bit silly to own this particular version of this title without the ability to play it in its full glory. Please look forward to SMS Phantasy Star FM soon!